I was right. Today there are leaves unfurled on the trees and they are growing thickly enough to block my view of both Mt Hood and the river. All is not lost, though. This is the view from the parking lot roof. True, I’m not up there all that frequently during the day. And I’m seldom up there when it’s still both light enough to see and clear. 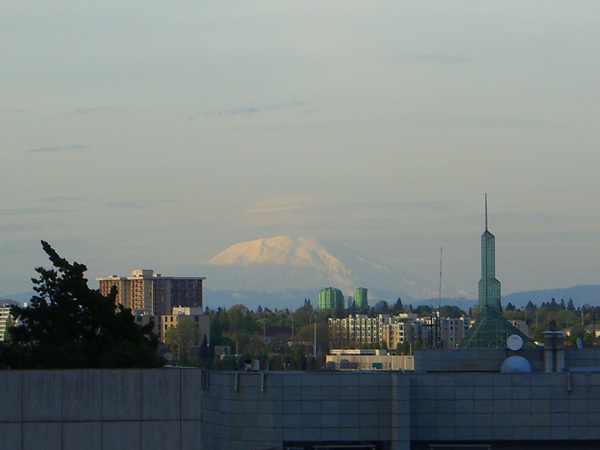 But on the infrequent occasions that I get to view Mt St Helens… what a magnificent sight. Our mountains have such presence. They just stand there against the sky, right in your face. Hills with attitude. I finished the socks for Tangle and cast on for the Embossed Leaves Socks from the Winter ’05 Interweave Knits. Except I’m knitting them toe-up. I know someone else who also knit this pattern toe-up, and I really liked the way that the leaves grew up instead of down. I continue to work on the lace leave scarf also. But today I forgot to grab my knitting on the way out the door, and I’ve felt lost all day. Ack!